Happy Halloween Eve! With nine days to go until our November 8th reading clubs, we still need 164 more readers - which means we again need YOUR help in recruiting them! Here are 5 easy things you can do right now to bring our "Wonders of Science and Technology" reading clubs to life! If you haven't already, please sign up today. "Join" our November 8th Facebook Event so your Facebook friends can see you are volunteering. "My favorite volunteer organization, Reading to Kids, is looking for more volunteers for their November 8th reading clubs. The theme is "The Wonders of Science and Technology", and all volunteers are encouraged to wear something with their college's logo to encourage the kids to aspire to college. Join me at ### Elementary School for a fantastic morning of reading to elementary school kids near downtown LA. 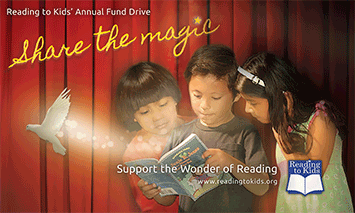 To join me, sign up online today at www.readingtokids.org." If you have people in mind who you think would really like to read with us, tag them in your post. It will alert them to the reading clubs and show up in their friends' news feeds. Use our handy email template (in PDF) to encourage people you know to sign up to read with us! Print out this flyer and post it in heavily populated locations such as coffee shops, the gym, your office, or other various community centers. Make it a personal and fun social event by including the school at which you'll be reading! If you're signed up but know you can't make it this Saturday, please be sure to cancel your RSVP as soon as you can. November 8th is also College Spirit Day, so be sure to earn honors for your alma mater and wear your college logo proudly! We'll be tallying the number of volunteers sporting their college logo that morning, then announcing the following week which college or university showed the most spirit at the reading clubs! We want to give each child who attends our November 8th reading clubs something small with a college insignia on it. If you can obtain college-related items, stickers are always a hit with the younger kids. For the older kids we like to give them pins/buttons, pens, pencils, notebooks, etc. But really, anything with a college logo will help plant the seeds of college interest. To "sponsor" one grade at one school, we need about 40 of one item. To sponsor all of one grade at all 7 schools, then we need about 225 of one item. And anything in between would be very helpful! The 2014 Annual Fund Drive is off to a great start with $6,007 donated from 123 donors! Those who have donated can see their names listed on our 2014 Annual Fund Drive page. If you have not yet donated, be sure to donate today so we can add your name there, too. Our Annual Fund Drive lasts until December 31st, and our goal this year is to raise $45,000 from 500 donors. Please help us meet that goal by spreading the word to your friends and co-workers! 2) Show your support by asking friends and family to contribute! Look under the "Help us Fundraise!" header for our handy donor sheet for raising money with your friends and co-workers, a sample email you can easily personalize, and tips for fundraising. We thank The Kleiner Cohen Foundation for its ongoing support of Reading to Kids with their most recent $2,000 grant. The Foundation has provided over eight years of support, allowing us to purchase beautiful read-aloud books that our school's libraries will continue to share with future generations. We would like to thank the Employees Charity Organization of Northrop Grumman for their continued support. The employees of Northrop Grumman generously donated another $1,000 to Reading to Kids. Since 2003, Northrop Grumman has contributed more than $18,400, helping us sustain our monthly reading clubs and providing over ten years of books that proudly sit on the shelves of hundreds of past and present LA Unified students. Thanks, and we hope you have a wonderful, safe, and fun Halloween!